CarbonSports is the best horse race betting app for U.S. citizens. 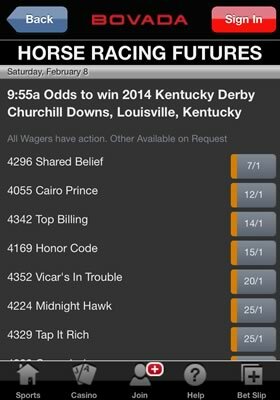 It's compatible with all types of smartphone and offers lines on ever harness thoroughbred & dog race. It also has the most detailed racecard and form guide. BetOnline is one of the only U.S. friendly mobile betting app that offers a full racebook service. Racing fans in the U.S. can now wager on every horse race from every race track via their smartphones. 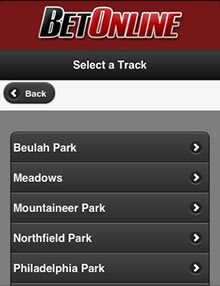 The BetOnline mobile racebook is compatible with ALL internet enabled devices and does not require a download. A wide range of betting options are available, including Win/Place/Show, Exactas, Trifectas, Daily Doubles and Pick3. Bonus: Betonline offer a 7% rebate on all mobile horse racing bets. Uniquely, they offer a 25% free play bonus on every deposit. Also get a $25 free play on your first in-play bet. ﻿Bovada (formerly known as Bodog) do not offer as comprehensive a mobile racebook as BetOnline. Instead they concentrate on offering horse racing futures on big domestic and international races, such as the Kentucky Derby, the Preakness Stakes, the Belmont Stakes, the Grand National, the Gold Cup, The Melbourne Cup, the Breeders' Cup and the Dubai World Cup. 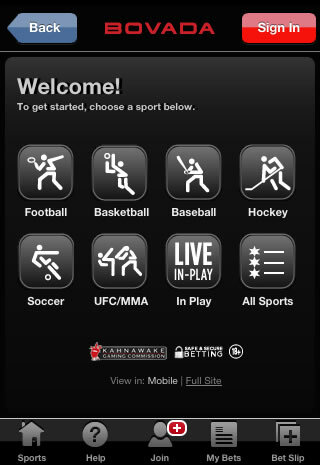 The Bovada app is web based so it is compatible with almost every types of phone or tablet that is internet enabled. Bonus: Bovada are one of the most generous U.S. racebooks, offering a 50% first bet bonus of up to $250, plus a weekly 5% rebate. Bovada also run ongoing promotions and offers for specific upcoming meeting and races. There would probably be little argument when we say that horse racing in the US is massively overshadowed by the likes of American Football, Basketball and Baseball. It’s for this reason that a lot of American sportsbooks generally give horse racing a pretty limited exposure. But it’s actually still a pretty big market and US bookmakers such as Carbon, BetOnline and Bovada have implemented markets into their mobile betting apps. What we will be looking at today is how they compare against each other. What we want to point out right away is that these two apps don’t even come close to that on offer from the European bookmakers. The depth, features and even design are some way behind them. But we are going to remain impartial and just simply compare them to each other at face value. 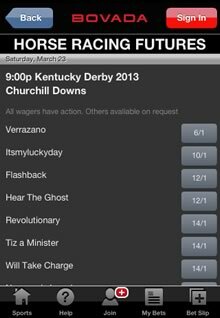 WHICH U.S. RACEBOOK APP HAS THE BEST DESIGN? The design of a mobile betting app is a massively important feature these days. No longer are we limited to a small screen on our phones and the development of tablet devices has allowed designers for even more screen real-estate. The increase in the usability of both devices also means that access is readily available as well. The Bovada app has a really modern feel to it and its black background with white text and graphics means it really stands out. The first thing that really strikes us is the simplicity of it all. They haven’t really gone with many images and have mainly kept the whole app text based, which actually works really when using on networks with limited connectivity. In fact, we found that even on connections with just GPRS the app still loaded in a surprisingly brisk time. Whether the tamed down graphics were done purposely or not we can’t comment, but they have certainly had a positive impact on the functionality of it all. Unlike Bovada, BetOnline’s mobile version looks a lot more basic and could be something from the early 2000’s in all honesty. It’s not great and whereas Bovada have gone with a simple yet polished version, Bet Online seem to have spent little to no time in their design stage and the results are massively noticeable. Having said that, once you get past the initial stages of the app weirdly the design seems to change a little into something a little more updated. Whilst it still doesn’t look particularly appealing, it looks so much better than the initial home page and navigation. Finally we come to Carbon Sports (Read the Full Carbon Review), who have created a slick horse racing app that looks great and functions really well. They've opted for a slimmed down approach, which means that pages load super fast. The homepage is broken down into 5 main sections: Featured Races, Upcoming, Thoroughbred, Harness and Greyhound which gives users quick access to whichever type of race they're interested in. Minutes To Post (MTP) data is also displayed so you know exactly how long you have left to place your bet. The top menu allows users to easily switch between Carbons mobile sportsbook, racing, casino and poker sections. There's not really much of a contest here in terms of design, with CarbonSports winning this one hands down. The app just looks so much more polished than the Bovada and BetOnline efforts. WHICH BOOKMAKER APP OFFERS THE GREATEST SELECTION OF U.S. RACING MARKETS? Depth is pretty much what we are looking for here and to see how much each app looks to diversify away from just the US races and into those from around the world. It’s often tough to find international markets from US bookmakers at the best of times, so this might be a little hopeful to say the least. We will stick with Bovada (Full Bovada Mobile Review) again to start and at the time of writing, there are literally no races on offer from the app. We knew Bovada weren’t the biggest advocates for promoting US horse Racing before starting this article, but we expected to at least have some it covered if only because of the size of the company. Not an awful more can be added really. BetOnline does carry races to talk about and actually a pretty good amount to boast. They actually cover racing better than almost any US bookmaker we have come across with markets for the major meetings throughout the country. If its international races you are looking for then you will have to look elsewhere. It still feels as if BetOnline are starting to find their feet a little with horse racing and it wasn’t that long ago that the company entered the racing sector. It is now, however a great addition to the app with a really strong market coverage. 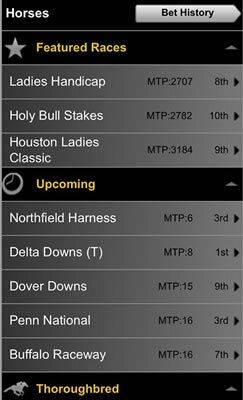 Once again the CarbonSports app blows its competitors out of the water with their mobile racing section, which not only covers every major thoroughbred racecourse in the United States, but also every harness and greyhound racetrack in the country too. While they do offer odds on races in the United Kingdom and Ireland, the vast majority of the races covered are in the United States. Only one winner here we’re afraid and that’s CarbonSports again. Whilst Bovada offers betting futures on major races like The Grand National, The Melbourne Cup, The Kentucky Derby, the Prix de l’Arc de Triomphe and the Dubai World Cup, the app offers virtually nothing on day-to-day racing either in the U.S. or worldwide. BetOnline have made more of an effort and feature races from approximately 20 of the biggest racecourses in the United States but they're still can't match the coverage offered by CarbonSports. Carbon offer U.S. citizens unrivalled access to virtually every horse and dog race taking place in the USA. WHICH RACING APP HAS THE BEST RACECARD? The information held within the modern day race card can be what makes or breaks a bookmaker’s horse racing app. There are so many options that can be included now and we have mentioned before about how apps these days can be so much more than just a betting outlet, but more a betting resource in terms of tips, form and even live streaming of races. 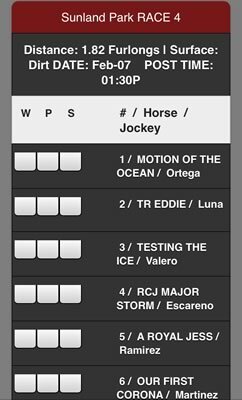 The Bovada racecard is pretty simplistic. All you get is a clear run down of the runners and riders along with the latest live odds. There’s not a massive amount more to say about it in all honesty. The BetOnline (Read Full BetOnline Review) race card again has that simplistic feel to it but you are able to choose between a large range of markets including win/place/show, exacta, exacta box, trifecta, trifecta box, seperfecta and daily doubles. 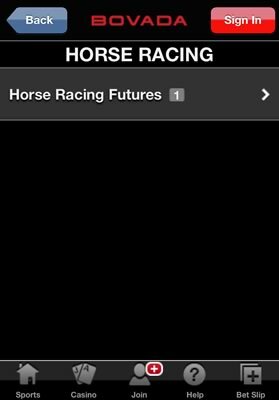 Once into your market you can see the horse name and jockey before selecting your market. Annoyingly though you can’t actually see the odds for your selection until you have chosen which horse you want to back. On the next screen you will have to confirm your bet where it shows you how much you have staked then how much you are set to win. While the CarbonSports racecard is no match for those offered by the big European bookmakers apps, it is significantly better than those offered by its two U.S. rivals. It provides information on the jockey, trainer, the morning line price and even a form guide. 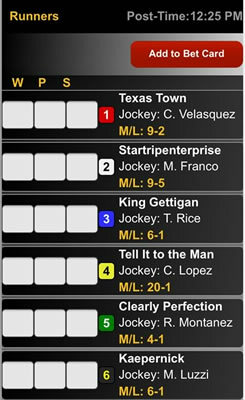 From the racecard you can select the the Win, Place and Show markets before you enter your wager amount. There are some massive fundamental flaws in the BetOnline racecard such as the lack of odds. 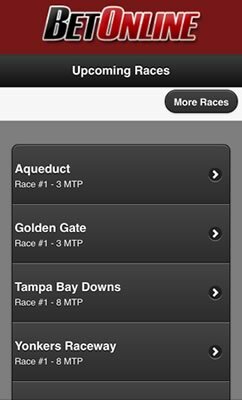 The Bovada racing app simply doesn't offer a wide enough range of markets to even consider it a contender. For this reason, Carbon Sports once again take the crown of best mobile racecard for iPhone, Android, BlackBerry and Nokia Windows Phone. The most interesting thing about reviewing the horse racing section of Bovada and BetOnline is how far apart from their European competitors they are. They really do both feel like they are almost prototypes made back 1999; but they aren’t. They are from large, reputable US bookmakers and this is what’s most confusing about the lack of effort and attention to both apps. 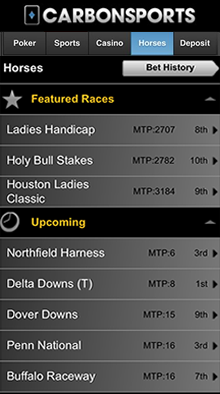 While the CarbonSports horse race betting app is not perfect, it is by far the best bookmaker app available to U.S. mobile gamblers at the moment. Offering a wide range of markets, a sleek design and a detailed racecard. The US horse racing markets is one that’s probably flown under the radar somewhat. Sports such as American football, basketball and baseball undoubtedly hold the monopoly in the US, but horse racing is actually very well supported and they have some massive horse racing meetings such as The Kentucky Derby, The Preakness, Breeders Cup and the Belmont Stakes, to name but a few. Funnily enough, each of hosts of the races above have all worked hard in producing a mix of mobile products and an increase in mobile availability at the racecourse for its customers. The increase in the use of mobile technology for horse racing fans around the world has been astronomical and rivals that of even the biggest sports. The reason it works so well with horse racing is that information can be found instantly at the touch of a button, and in a sport where certain factors can change and in turn have a massive effect on how a race could turn out, is a priceless asset. What types of apps are on offer? The biggest attraction for mobile users in the US has to be the inclusion of live streaming apps. Whilst these apps aren’t necessarily a new concept to the world of mobile horse racing, the fact that US punters can gain access to an app called Horse Races Now which includes racing from 33 different racetracks throughout the US completely free, makes this a real treat for US racing fanatics. There are other apps which have a more worldwide appeal such as Paddy Power. Racing news and form mobile apps are without doubt some of the most popular apps going. They are basically an electronic version of the racing papers and guides that US punters can pick up but are generally available for free. Coupled with this is the emergence of a host of free apps that include tips and things to look out for when betting on horse racing. Admittedly, these apps vary in quality, but some of the bigger bookmaker brands such as CarbonSports, BetOnline and Bovada both offer these from their website, so should be pretty solid. Price comparison apps aren’t really a new feature within the world of horse racing, but they are arguably still one of the most important tools. Horse racing is probably one of the most competitive sports when it comes to bookmakers selecting lines and with the sheer volume of money that is traded on races every day, the odds can fluctuate, and often. The price comparison app should give you real time data in what the price is of a certain horse. So if you were looking at the odds for say Certify, an odds comparison app will list the live odds for the horse over a number of bookmakers before you make your selection. There are a couple of things to note when using comparison apps though. The first being that you need to make sure the lines are updated regularly as prices can hike and dive within a matter of minutes. Secondly, you need to find one with a good range of bookmakers. A better range will allow you to see a more stable ‘industry’ price before seeing if you can get better elsewhere. Ideally they want to at least include BetOnline and Bovada which both have brilliant mobile horse racing sections on their app.